Arlimahera's Grip is a ruined fortress in eastern Bangkorai, east of Martyr's Crossing. 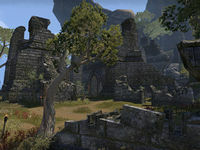 The ruin has become overrun with Daedra. The group boss location Arlimahera's Sanctum is located at the back of the ruin, and the Ephesus Dolmen is in the southern section.